US Navy fighter jet pilots are reported to have executed "impressive barrel rolls" above Inverness while taking part in a major military exercise. The US Navy is taking part in Saxon Warrior off the coast of Scotland along with the Royal Navy. 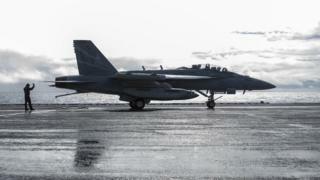 Crews of F/A-18 Hornets have been flying training sorties over the Highlands from aircraft carrier USS George HW Bush. The barrel roll was spotted on Tuesday evening. The onlooker who spotted it tweeted: "Impressive barrel rolls right over city centre then v low flyover." Others tweeted seeing the Hornets from Tomatin, south of Inverness, and above the Great Glen, which Loch Ness is a feature of. One tweeter suggested that if the crews flew slower they would enjoy a better view of the glen and loch. Over several hours on Tuesday, Hornets could be heard if not seen as they flew over Inverness and the surrounding area. People have also told of seeing the jets barrel rolling above John O' Groats. The Highlands is frequently used during Nato exercises, with the largest being Joint Warrior which is held in spring and autumn. There are 15 ships from across Nato taking part in the exercise and more than 100 aircraft and almost 10,000 personnel. USS George HW Bush is part of a group of ships that includes two Portsmouth-based Royal Navy Type 23 frigates, HMS Westminster and HMS Iron Duke, also US destroyer USS Donald Cook, missile cruiser USS Philippine Sea and a Norwegian frigate. The Royal Navy's new aircraft HMS Queen Elizabeth, which is being put through sea trials off Scotland, joined for the group for a time earlier this week. The warship is expected to arrive at its home base of Portsmouth between 17 and 22 August, said the navy.